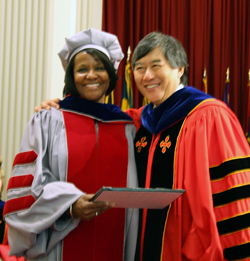 Dr. Espy-Wilson receives the Distinguished Scholar-Teacher award from University of Maryland President Wallace Loh on Oct. 9 at the Faculty & Staff Convocation. Congratulations to Professor Carol Espy-Wilson (ECE/ISR), who has been selected as a 2012-2013 Distinguished Scholar-Teacher by the University of Maryland. She joins Professor Avis Cohen (Biology/ISR) 2011–2012, Professor K.J. Ray Liu (ECE) 2007–2008, Professor Michael Fu (Robert H. Smith School of Business/ISR), 2004-2005; Professor Steven Marcus (ECE/ISR), 2000-2001; and Professor Emeritus Thomas McAvoy (CheBE/BioE/ISR), 1997-1998; as ISR winners of the award. Espy-Wilson is the ADVANCE Program for Inclusive Excellence Professor for Women Faculty of Color in science, technology, engineering, and mathematics (STEM). She is a member of the National Advisory Board on Medical Rehabilitation Research, which advises the National Center for Medical Rehabilitation Research at the National Institutes of Health. This board fosters the development of scientific knowledge needed to enhance the health, productively, independence, and quality-of-life of people with disabilities. She also was appointed a fellow of the Radcliffe Institute for Advanced Study for the academic year 2008–2009. In 2010, Espy-Wilson won a number of awards for her multi-pitch tracking in adverse environments invention, which radically improves sound quality over cell phones and in hearing aids, among other devices, and for her start-up company Omnispeech LLC. These awards included the 2010 Maryland Innovator of the Year, sponsored by the Maryland Daily Record; the 2010 $50,000 SAIC-VentureAccelerator Competition; the Rockville Economic Development Inc. StartRight! Women’s Business Plan Competition; the “High Technology Category” of the 2010 University of Maryland $75K Business Plan Competition; and the University of Maryland’s Invention of the Year competition in the Information Science category. She is the recipient of numerous NSF, NIH and DoD grants for digital speech forensics, speech aids for tongue cancer patients and technology for those with cochlear implants, as well as for her work in background noise suppression. The Distinguished Scholar-Teacher program recognizes faculty members who have demonstrated outstanding scholarly achievement along with equally outstanding accomplishments as teachers. Nominees for the award are selected by their peers; the winners are chosen by a panel of former Distinguished Scholar-Teachers. Espy-Wilson is one of only six faculty members so honored this year. The Scholar-Teachers bring a passion for learning to their colleagues and students, and serve as models of what a professor at a fine research university should be. Winners receive a cash award to support instructional and scholarly activities, and make a public presentation in the fall semester on a topic of scholarly interest.